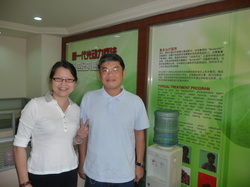 Kelly and Leong arrived from the hospital directly from the airport. She felt slight pain on her right lymph node this morning. Doctor confirmed that this is a common reaction. 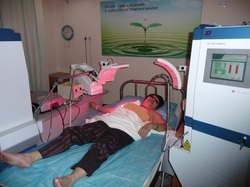 The singlet oxygen produced by the photosynthesis reaction of the Chlorophyll with the light exposure caused the tumor cell walls to burst or cell to explode. This feeling of swelling or slight inflammation indicates the reaction of the tumor with NGPDT treatment. Kelly and Max consulting with Dr Kong, the expert on NGPDT from Chengdu Hospital to understand more about the cancer treatment using NGPDT. 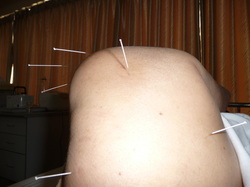 Can you guess which part of the body is this Acupuncture needles placed?